Be the first to share your favorite memory, photo or story of Jimmye. This memorial page is dedicated for family, friends and future generations to celebrate the life of their loved one. 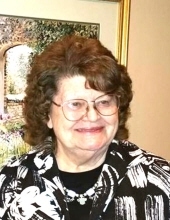 Jimmye Lynn Weed, 82, of New Boston, Texas passed away Friday, January 25, 2019 at a Texarkana, Texas care facility. Jimmye was born April 16, 1936 in Avery, Texas to Ernest Raymond and Norvell Banner Bradley Jones. She was a retired Licensed Vocational Nurse and a homemaker. Jimmye was a member of the Assemblies of God and was a licensed minister who was involved in women's ministries. She was also an election judge and volunteer. She was preceded in death by her parents; four brothers, Raymond Jones, John Chapman, Sidney Chapman, and Bob Bradley Jones; one sister, Mildred Chapman Gardner; and one granddaughter, Heather Nichole "Nikki" Weed. She is survived by her husband, Wilson Weed of New Boston, Texas; two sons, Bill Weed of New Boston, Texas and Steve Weed of Texarkana, Texas; two daughters and one son-in-law, Sharon and Mark Tims of Granbury, Texas and Connie Pritchett of New Boston, Texas; five grandchildren, Clint Weed and his wife, Shelby, Alexandra Weed, Lesley Ross and her husband, Robert, Johnathan Carter and his wife, Elisha, and Kelli Eubank and her fiancé Tim Dupree; seven great grandchildren; and numerous other relatives and friends. Services will be 2:00 P.M. Saturday, January 26, 2019 at Bates Family Funeral Home in De Kalb, Texas with Bro. Bryan Peck and Bro. Don White officiating. Interment will follow at Pine Springs Cemetery in Avery, Texas. Visitation will be from 1:00 P.M. to 2:00 P.M. Saturday, January 26, 2019 at Bates Family Funeral Home in De Kalb, Texas. Memorials may be made to Hospice of Texarkana, 2407 Galleria Oaks Dr, Texarkana, TX 75503. To send flowers or a remembrance gift to the family of Jimmye Lynn Weed, please visit our Tribute Store. "Email Address" would like to share the life celebration of Jimmye Lynn Weed. Click on the "link" to go to share a favorite memory or leave a condolence message for the family.